1. Preheat the oven to 180ºC, gas mark 4. Put the butter and sugar into a food processor and blitz until light and fluffy. Add the egg yolks and whizz the mixture. Alternately, add the flour and coconut with the milk. Blend until you have a smooth batter. Add the lime zest and juice. 2. Halve the passion fruit and scoop out the pulp and seeds. Remove and discard about ¹⁄³ of the black seeds (just sieve the pulp and add ²⁄³ of the seeds back into it) and add this to the batter. Pour the batter into a large bowl. 3. In a clean bowl, beat the egg whites until stiff, then, using a large metal spoon, fold ¹⁄³ of this into the batter to loosen it, then fold in the rest. 4. 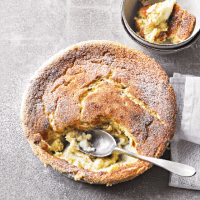 Spoon into a buttered 2-litre ovenproof pudding dish and set it in a roasting tin. Pour boiling water into the roasting tin to come about halfway up the sides of the pudding dish. Bake for 45-50 minutes. Allow the pudding to cool a little when it comes out of the oven then sift some icing sugar over the top and serve with thick cream.